A Warm Welcome from... Brandon Born is an internationally published photographer from Cold Lake, Alberta. His photographs consist mostly of landscapes with an adventure focus. His work has been published by companies such as, National Geographic, Travel Alberta, and Matador Network. Brandon has worked with photographers such as Michael Matti and Michaela Potterbaum. 5 years into his business, Brandon is working his way into the guiding industry so that he can take people into the backcountry to learn to take incredible photos of nature. Follow along in his adventures through Instagram or Facebook to be inspired to explore more of this world. Front Cover Photo copyright 2017 Brandon Born – Medley River at Cold Lake. IG: @BrandonBorn FB: /BBornPhotography www.bbornphotography.ca See other photo on page 62.
the people and personalities who bring you Go East of Edmonton every year! Steve Ricketts is a self-taught landscape photographer who specializes in capturing the beauty of the Alberta prairies near his home in Sherwood Park, especially in Strathcona, Lamont, Minburn and Two Hills Counties. Over the past year, he has found himself drawn to black & white photography as it draws the viewer’s attention to the contrast and texture in landscapes. Visit www.stevericketts.ca See photos on pages 23, 40 & 41. 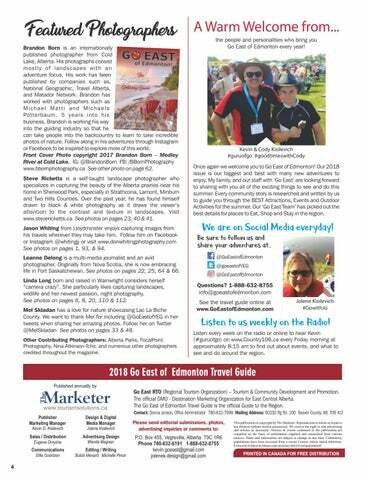 Jason Whiting from Lloydminster enjoys capturing images from his travels wherever they may take him. Follow him on Facebook or Instagram @whitingjj or visit www.donwhitingphotography.com See photos on pages 1, 93, & 94. Leanne Delong is a multi-media journalist and an avid photographer. Originally from Nova Scotia, she is now embracing life in Fort Saskatchewan. See photos on pages 22, 25, 64 & 66. Linda Long born and raised in Wainwright considers herself “camera crazy”. She particularly likes capturing landscapes, wildlife and her newest passion, night photography. See photos on pages 6, 8, 20, 110 & 112. Mel Skladan has a love for nature showcasing Lac La Biche County. We want to thank Mel for including @GoEastofYEG in her tweets when sharing her amazing photos. Follow her on Twitter @MelSkladan See photos on pages 33 & 48. Other Contributing Photographers: Alberta Parks, FocalPoint Photography, Nina Atkinson-Tchir, and numerous other photographers credited throughout the magazine. Kevin & Cody Kisilevich #guruofgo #goodtimeswithCody Once again we welcome you to Go East of Edmonton! Our 2018 issue is our biggest and best with many new adventures to enjoy. 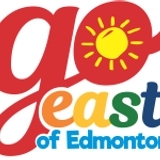 My family, and our staff with ‘Go East’ are looking forward to sharing with you all of the exciting things to see and do this summer. Every community story is researched and written by us to guide you through the BEST Attractions, Events and Outdoor Activities for the summer. Our ‘Go East Team’ has picked out the best details for places to Eat, Shop and Stay in the region. We are on Social Media everyday! Listen to us weekly on the Radio! Listen every week on the radio or online to hear Kevin (#guruofgo) on www.Country106.ca every Friday morning at approximately 8:15 am to find out about events, and what to see and do around the region. This publication is copyright by The Marketer. Reproduction in whole or in part is not allowed without written permission. We reserve the right to edit advertising and articles as necessary. Articles & events contained in the publication are compiled on the basis of information supplied and researched from various sources. Dates and information are subject to change at any time. Community populations have been accessed from a recent Census, unless stated otherwise. Extra care is taken to ensure copy accuracy but it is not guaranteed.